This was my second attempt at a humanoid robot. It was constructed using ABS plastic pipework for the body and aluminium and carbon fibre brackets and arm sections. It uses Tower pro servos for actuation, digital servos for the first shoulder joint and standard analogue servos for the rest of the joints. Each servo has a corresponding potentiometer to measure actual joint positions. The robot uses an arduino mega 2560 as its controller to move the servos and read the potentiometer values. A control loop for each of the servos takes a position as an input and drives the servo to the desired position. The arduino is connected to a PC which is running custom software to send and receive packets of data containing potentiometer values or desired servo positions. Sliders allow the servo positions to be manually controlled and the actual servo positions are displayed on the screen. 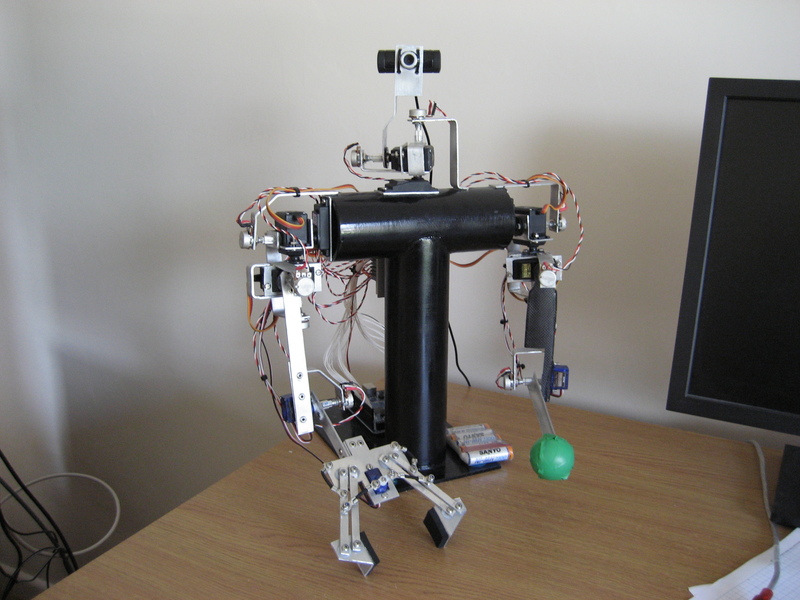 I eventually equipped the robot with a servo driven gripper which worked great. The robot is also equipped with a video camera. Im using openCV to detect coloured objects and move the head/camera to track the object. If the coloured object is attached to the end of the robots arm then the robots head will follow the position of the hand. The video below shows this in action.